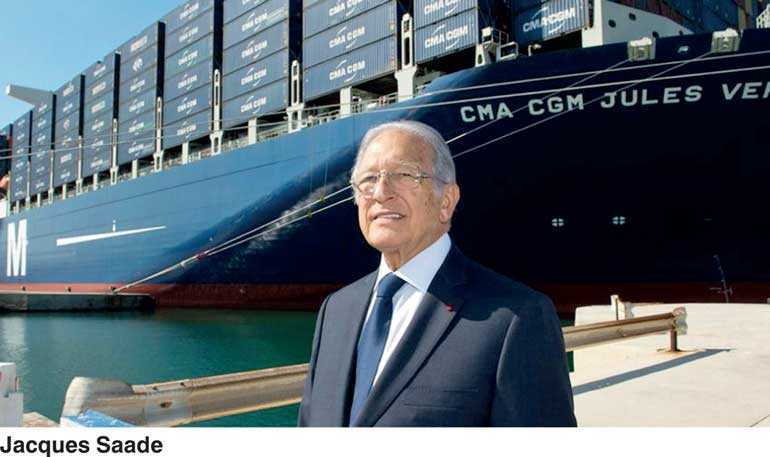 PARIS (Reuters): Jacques Saade, who founded France’s CMA CGM 40 years ago as a one-vessel firm and built it into a global container shipping giant, has died aged 81, the company said last week. Saade, a major figure in French business circles, set up the Compagnie Maritime d’Affretement (CMA) in 1978 in the Mediterranean port city of Marseille, after leaving Lebanon during the civil war in that country. Starting with just one ship operating between Marseille and Beirut, Saade used a series of acquisitions in the following decades to transform the family firm into the world’s third-largest container line behind Maersk and Swiss-based MSC. Container shipping lines dominate global freight volumes. China was central to the group’s expansion. Saade opened the company’s first Chinese office in Shanghai in 1992, and a quarter of a century later the group says one of its ships leaves China every three hours. On an official visit to China, French Prime Minister Edouard Philippe paid tribute to Saade, describing him in a Twitter post as a “visionary entrepreneur” and “one of the first to anticipate the immense potential” of China. Philippe visited one of CMA CGM’s giant container ships, accompanied by Saade’s son Rodolphe, who took over as chief executive last year. Saade’s daughter Tanya is also an executive and board member at the firm. The Saade family has survived severe downturns in a volatile shipping industry, including a slump in 2009 during the global financial crisis that led the family to bring in Turkish conglomerate Yildirim and French state bank Bpifrance as minority shareholders. CMA CGM overcame another shipping downturn two years ago that saw the collapse of South Korea’s Hanjin Shipping. That downturn triggered a wave of consolidation and CMA CGM has used its acquisition of Singapore-based APL in 2016 to reinforce its global scale. The company reported a $701 million net profit for 2017, confirming its turnaround after a $452 million loss the year before.